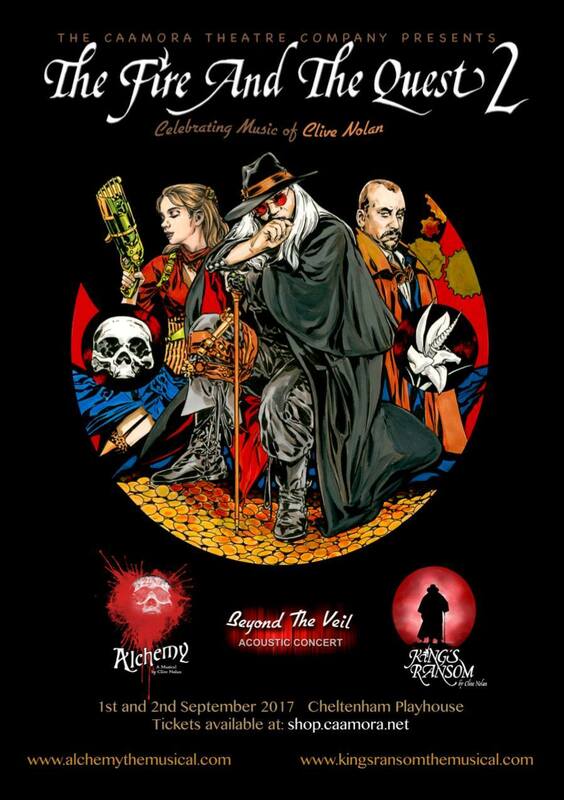 "The Fire and the Quest 2" Separate Tickets On Sale! 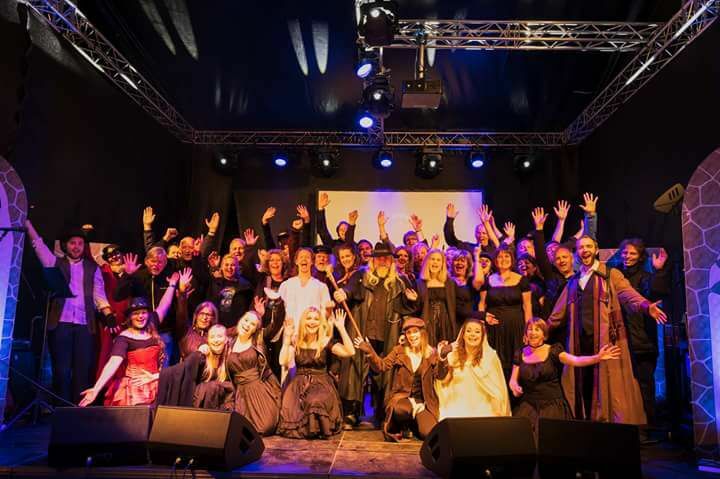 In May 2017 Caamora Norway debuted with an all-Norwegian production of Clive Nolan's musical "Alchemy". The shows took place in Sætre (sold out show), Kolbotn and at the Mysen Høytorp fort and featured Clive Nolan in his original role of Professor Samuel King, and the talented theatre artists and musicians from Norway, including Eirikur Hauksson as Lord Henry Jagman, Elisabeth Syrdahl Ellingsen as Amelia Darvas, Harriet Müller-Tyl as Eva Bonaduce, Christine Ekeberg as Jessamine and Mrs. Muncey, and many others. The singers were accompanied by the instrumentalists from the progressive rock band The Windmill. The Norwegian shows met with enthusiastic reception from the audiences and critics alike, which was reflected in numerous positive reviews in the local press. The final show at the Mysen Fort was filmed for DVD, which will be released later this year. Hopefully, Caamora Norway will return with the next Nolan production soon. Clive Nolan: “I am now sitting back in the UK after a two week adventure in Norway. And this was indeed quite an adventure, culminating to some wonderful performances of ‘Alchemy’! If I try to thank everyone, this list will go on forever, and I would still manage to miss some people, so, if I may, just some highlights… Thanks you to Morten L Clason for interrupting my breakfast on 6th September 2015, where the seeds of ‘Alchemy Norway’ were sown. About 20 months later, and we did it! I say ‘we’ but this time, it was a pretty easy ride for me. Morten along with the lovely Ingar Diskerud, and Are Høidal managed to get this whole machine moving along, whilst Magdalena Grabias and Astraea Antal scurried around promoting the events. The final result at the Hoytorp Fort was truly spectacular… I loved it! Massive thanks to the band, the chorus and of course the marvellous principals for their part in this terrific show: you were all superb and there was some excellent singing and acting on that stage which was great fun to be a part of. The sound, the lights and the video just added to the excellence of the evening! There were also so many wonderful details: the programme, tickets, posters, the terrific costumes, photographs, filming, and of course the much welcomed catering from what I privately called ‘Team Hilde’ (there were at least three of them: Hilde Johanne Eriksen Clason, Hilde Klepper Eriksen, Hilde Chistiansen along with Siren Iversen Diskerud, Geir Eriksen, Tove-Lill Grefslie and Pål H. Christiansen). 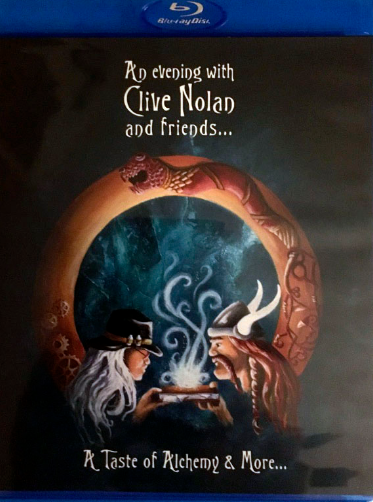 It says on the back of the programme that ‘Caamora Norway will return’…. well you can “take is as a fact, you can bet your final pound” that they certainly will… “our work is not yet done!” Thank you again, everyone!! During the first days of April Clive Nolan took part in a series of rehearsals for the Caamora Norway production of his musical “Alchemy”. The shows will take place in Norway: Hurum, Kolben and Mysen from May 21st-27th 2017. Clive will return to the stage in his original role of Professor King. 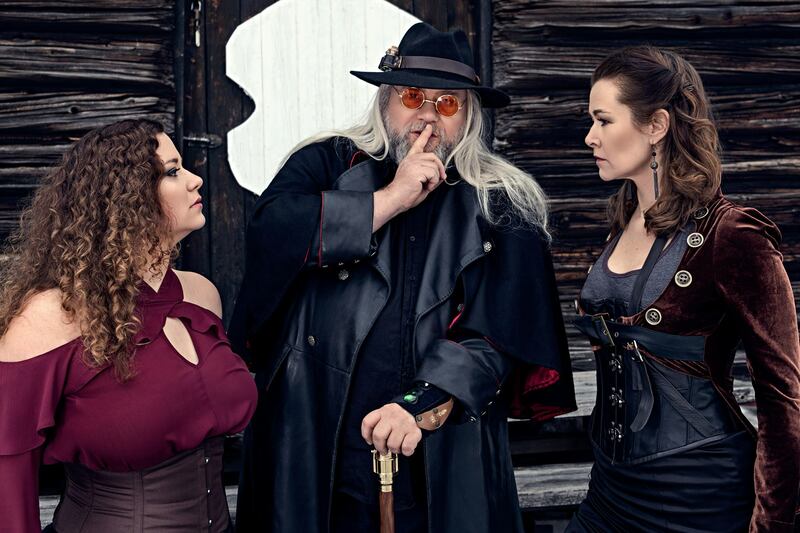 The cast will also include Eirikur Hauksson (Magic Pie) and Elisabeth Syrdahl Ellingsen, the lead vocalist of Clive's 2016 concerts in Uruguay, and many others. The Norwegian shows will also feature the live band (The Windmill) and the chorus. Tickets for all events are available HERE. Clive Nolan: "I’m finally back from Norway… I got to stay a little extra thanks to fog… A lot of waiting around! However, there was no waiting around during the weekend of rehearsals. Everyone pulled together brilliantly, and I was able to watch the massive improvements before my every eyes! Well done to the whole cast, musicians, the chorus and crew for an excellent effort. I look forward to the next rehearsal and the shows in May." 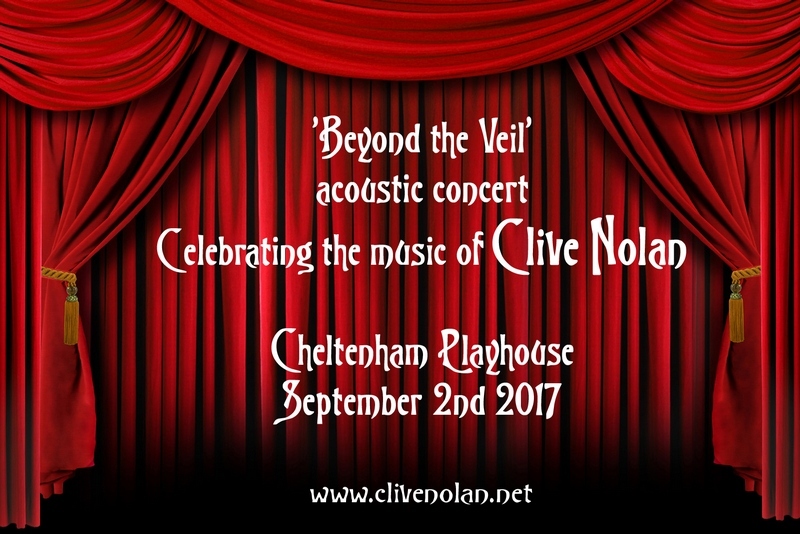 "An Evening with Clive Nolan and Friends: A Taste of Alchemy and More..." is the acoustic show recorded in October 2016 in Norway, featuring Clive Nolan (piano and vocal), the original Caamora soprano Gemma Ashley, and the cast of 'Alchemy' in Norway, including Eirikur Hauksson (Magic Pie), Elisabeth Ellingsen, Harriet Müller-Tyl, Christine Ekeberg, Finn Mathisen, Magdalena Grabias and the instrumentalists (from the Norwegian progressive rock band, The Windmill): Morten Clason (flute), Stig Andre Clason (guitar) and Arnfinn Isaksen (bass).